Sesbania gum powder is an extract from seeds of Sesbania. These seeds are also known by several other names like Sesbania aculeate, etc. The Sesbania tree grows in several parts of Asia, China and in Africa. This is a plant that grows up to two meters in height, is fibrous, short stemmed, tough, and has long leaves and yellow flowers. This produces pods and has light brown beans. The article goes on to describe Sesbania-Gum powder, its application in the mining industry and the many other applications it has. What is Sesbania Gum Powder? This is a polymer of the category galactomanna polysaccharide. It is highly soluble in water (hot or cold). It is a white or cream colored (milky powder) powder that can dissolve in water, but is not soluble in alcohol, ketones, ether, etc. This creates a highly viscous liquid solution with a pH value ranging from 6 to 11 when mixed with water at room temperature. Thus, its viscosity is higher compared to other similar substances like Sodium Alginate. This has many applications in the Mining industry and several other industries as well. It is popular for its application in the mining industry as it servers several purposes. The mining industry often has a requirement for separation of minerals from gangue or waste particles using flotation agents. 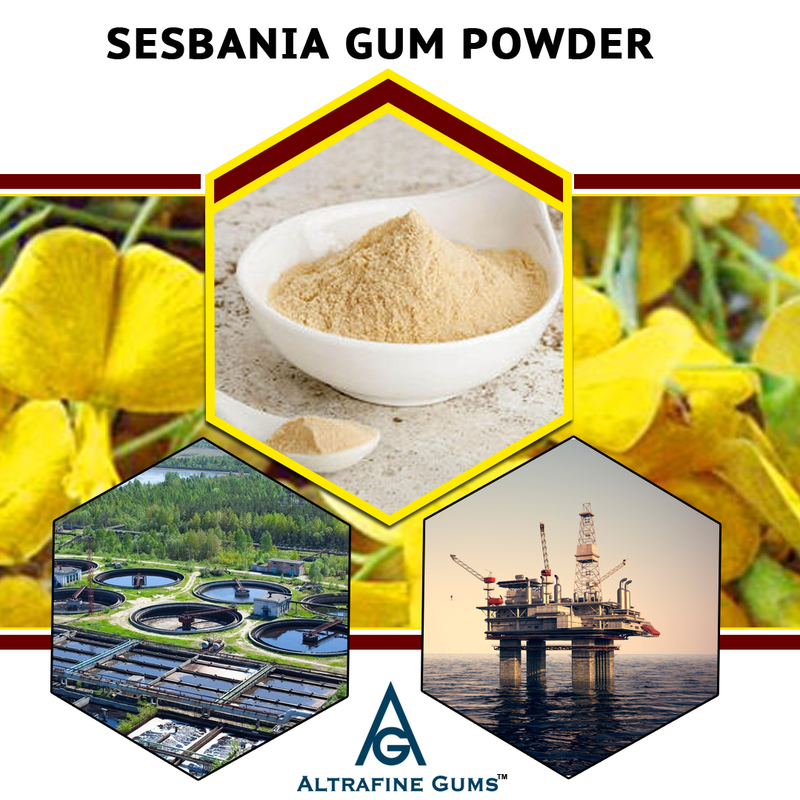 Since Sesbania Gum Powder is a powerful flotation agent; it comes in handy for this purpose. The fact that chemicals bearing this property help in maximizing the waste separation process is an added bonus. There are several chemicals that can be useful for the purpose of a flotation agent, but not all of them are that efficient, since each one reacts differently. This contains 10% to 15% higher viscous property and is also useful as a depressant. Hence this helps enhance the flotation process and increase the mineral recovery rate as well. The mining industry also makes use of water gel explosives; it is important that these explosions are safe and as controlled as possible. Hence several chemicals are utilized like Sodium chloride, Sesbania Gum powder, Sodium nitrate etc. While the sodium chloride is an inhibitor the aim adding Sesbania-Gum Powder is to add binding. All these substances are processed together to create a gelatinous water gel explosive. The advantage of making use of Sesbania-Gum Powder is that it is an excellent binder and has a thickening property as well. Besides which it also has a good elasticity property which is useful for this type of an explosive. It has a wide range of applications like domestic, commercial and industrial. Due to its unique properties, it is useful as a sizing agent as well as a dye thicker in the textile industry. It is useful to make incense and it is also of great value to the oil industry. It has several useful properties like being a blocking agent, reduction agent, being water resistant as well as a tackier for producing fluid cracking which in turn helps increase the rate of production of oil. Besides this, it has several other applications like in the treatment of waste water (as a flocculant in water) and even a substitute for Guar Gum Powder. It has also has several household, business and mechanical applications. Thus, Sesbania-Gum Powder is of great value to the mining industry and also has several other applications. Polysaccharides such as starch, cellulose, sesbania gum powder have now been extensively used in different industries and are used as water-soluble thickening agents in different industries that includes agriculture, oil industry, textile industry and many more. It is a white milky powder that is been extracted from sesbania seed. It is also used in incense. Sesbania Gum Powder is soluble in water, insoluble in ketones, alcohol, ethers and other organic solvents. In order to form a viscous solution, it can be dispersed into cold water that remains higher than other natural gum. It is anionic in nature and preserved easily due to its eco- friendly nature. It consists of some amount of concentration, having 5-7 pH value, with near about 10% moisture and 200 mesh of filtration. In the textile industry, sesbania gum powder is used as sizing agent and dye or coloring thickeners that has printing properties like good color yield, penetration, sharpness in prints, as well as it is cost effective. It plays a major role as a flocculant in water and waste-water treatment. It is also been used as a blocking agent, water resistance- reduction agent or tackifier in different industries. Initially, sesbania gum is been separated from the seed with a certain process. For the phosphorylation of the gum, the dry gum powder is been mixed with the solution phosphate salt in water and has been prepared with standard methods. The printing paste for printing in the textile industry is been prepared with the combination of acid dye, urea, boiling water, sesbania gum powder that is used as a thickener and other wetting agents. With the help of conventional screen printing technique, this printing paste is applied to wool, fabrics etc. Once printed, fixation of the goods is been done with the help of steam at a certain temperature. Further, washing of the fixed printed goods is been done with cold water following with different stages with the finished product. Sesbania Gum Powder shows with its fastness properties like color fastness to washing, light, crocking, perspiration etc. Hence, printed goods were dried and assessed with its overall fastness properties. There is a growth of the textile industry, so is the increase with the demand in sesbania gum powder. Altrafine provides high-quality gum powder for different industries. We provide our best product with accurate composition, ph value, high viscosity, solubility, and excellent surface tension. To ensure flawlessness, our product is checked on the various grounds of the industry. Along with this, we also offer different products that include guar gum powder, cassia powder, fast hydration guar gum powder, Psyllium husk powder and many more. Like sesbania gum powder, they are also been used in different industries having its different properties and functionality. We are also the provider for Indian spices and seeds as well as animal feed products. For more information, contact us today and get acquainted with our other gum products. 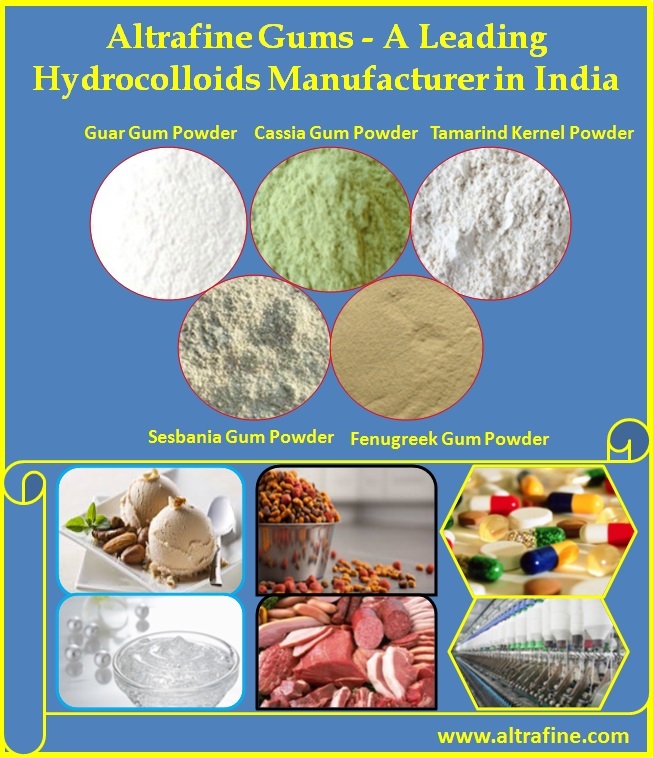 In this scientific and technological world research shows that there are wide variety of gum powder are been used for variety of purposes with its medicinal benefits. One of them is the Sesbania Gum Powder which is mainly been extracted from the sesbania seeds . Sesbania is an annual plant which mainly grows in China, Asia and Africa. The Sesbania Gum Powder has several different uses, like it is been used as dye thickener in the textile industry as wells as used for making incense. It is been used as blocking agent hence helps in the waste water treatment. There are also uses of Sesbania Grandiflora which is been used to produce this gum powder. Sesbania Grandiflora or sesban is also known as vegetable hummingbird, agati, or the hummingbird tree. This plant has its medicinal properties, and medicinal uses which will help you to cure different diseases. Sesbania Grandiflora has aperients, diuretic, emetic, emmenagogue, febrifuge, laxative, tonic properties which helps to cure many ailments externally as well as internally. Externally it helps to cure most of the skin diseases including with the bites of poisonous insect animals as well as can also be applied on the rheumatic joint. Root bark is helpful in gaining relief in the pain for rheumatic joint. Internally, it is been used to cure cold and cough, fever in the body or extensive heat, jaundice etc. The juice of flower been made helps to cure with the vision problems like night blindness or any other eye diseases. It is also been used to cure the migraine problem. It cures stomach disorders in children as well as in new born baby. Because of its laxative medicinal properties it checks for anemia, tumor and also helps to improve memory. Leaves are been used to cure the oral and throat infections. To relieve pain and inflammation associated with arthritis roots and barks paste is been applied externally. Leaf juice is been used as nasal drops to relieve headache and remittent fever. Roots when taken with honey help to cure catarrh. Leaves are sweet, cooling which are also been used to make tea which also helps to cure nasal catarrh. There are also other uses of Sesbania Grandiflora where the pulp of the wood is been used to make paper. The old trees are been used in house construction as well as used as poles. In fact, rather than the other uses it makes a more impact on the medicinal properties. 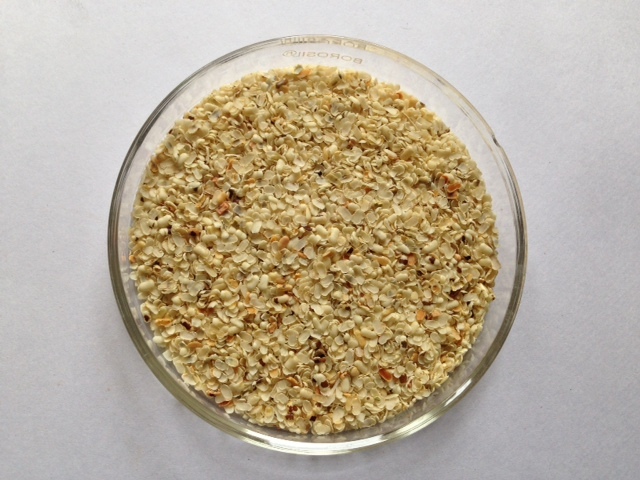 Guar gum powder is also known as guar flour, procured from seeds of Guar plant. Since many years, it has been cultivated in countries like India and Pakistan but to meet the increasing demand of guar gum powder, countries such as Brazil, South Africa, Australia and USA (Southern states of USA such as Arizona and Texas) started importing guar gum and its derivatives. 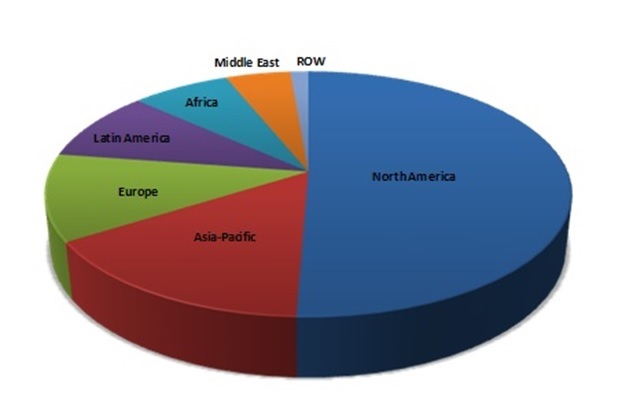 Why Guar Gum Powder is Trending Worldwide? One can witness the usage of Guar Gum powder in almost every growing industry. Visible growth has been seen in food industry, pharmaceutical industry, textile industry or oil and gas industry. It is quite cost effective as compared to other stabilizers and thickeners. In short, one can conclude that the Guar Gum powder has great importance in wide industrial applications. It is used as stabilizer, water retention agent and thickener in food industry and in other industries like pharmaceutical, textile, cosmetics, paper manufacturing and more. Used in baked food, frozen products, dairy, pet food, feed additives and etc. Used as stabilizer, thickener, viscosifiers and suspending agent in the oil and gas industry. The consumption of guar gum is 20% in food industry. Guar gum is consumed 10% in industries like pharmaceutical, cosmetics, paper and etc. Major consumption is seen in oil & gas industrywhich is 70%. 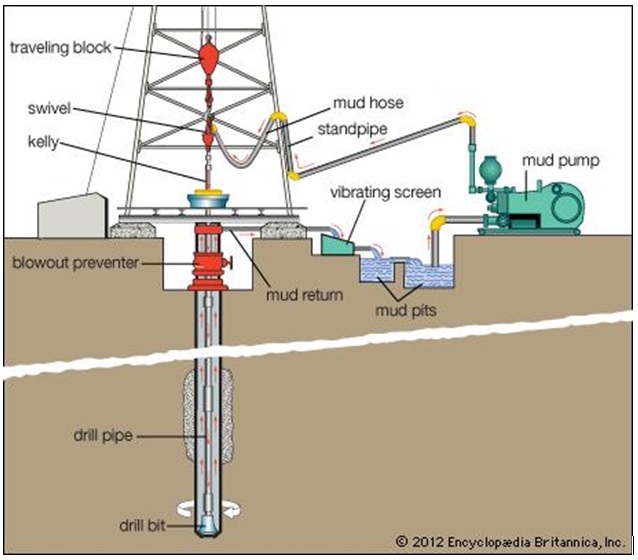 Drilling in well, water and geological. Removing drill waste from deep holes. 2014: A significant decline in the exports of guar gum was observed due to depreciation of Russian currency. 2015: A notable increase in demand of guar gum was witnessed due to fall in the prices of guar seeds. 2016: A bearish trend was observed in the market of guar gum as the petroleum industry cut down the usage of guar gum due to reduction in oil prices. 2017: In this year, the guar gum was able to achieve its past glory as its demand increased due to demand of gluten free baked products. 2018: Since in this year, the price of crude oil has been raised to a prominent level, the requirement of guar gum is booming. The demand of guar gum is seen to be fluctuating in economy. he development of alternative energies resulted into stable rates of guar seeds, increase in price of oil and many favorable factors resulted into increase of sales of Guar Gum powder. According to studies of a research firm, there is a significant increase in the use of Guar gum in the manufacturing of drugs as it is beneficial to manage health disorders. The demand and supply of guar price not only rely on oil prices but also on production of guar seeds which again relies on natural elements and geographical spread. With widening of geographical spread and awareness about guar, its prices are now moderate which has made it as feasible preference for purchasers. The studies show that the global gum market would surpass US $ 1300 million by the end of 2026. If you want to experience the best customer service, contact Altrafine Gums. 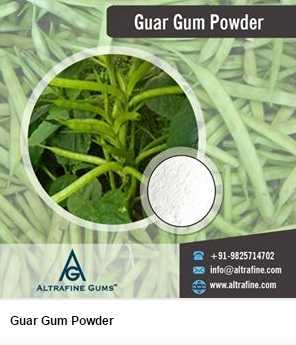 Altrafine Gums is one of the leading processor and supplier of guar gum powder since last 36 years. We provide a wide array of products which includes Guar Gum, Cassia Gum, Sesbania Gum Powder, Psyllium Husk Powder and many more. The prime objective of our company is to provide quality products after inspection and quality tests. We use hi-tech machineries to maintain its quality and enhance yield. Our company has set the benchmark by winning the award of Gujarat’s biggest exporter. Why India is the Major Exporter of Sesbania Gum Powder? Sesbania bispinosa / aculeate also known asPrickly sesban, is a legume plant which is cultivated in India.It is an annual plant that grows from 0.6 to 3 meters long and has a woody stem.The seeds of this plantare processed to get Sesbania Gum powder.It is used in various industries such as Textile, Oil, Waste Water Treatment, Mining etc due to its properties of viscosity and solubility in cold water. Some facts about Prickly sesban! The plant is used as a green manure crop. A green manure is created by leaving uprooted or sown crop plants on the field to serve as mulch and soil amendment. It is often used as major crop of crop rotation and hedge plant in paddy cultivation. The genus name Sesbania is a Latin version of the old name “Sesban” of Arabic origin. It is used as fodder, shade and hedge plant. The plant is classified as ‘Least Concern’ in the International Union for Conservation of Nature (IUCN)Red List of Threatened Species(2013). India has a suitable climate which promotes the growth of Sesbania bispinosa. It requires hot and humid temperature. It requires plenty of water. It can grow in most of the soil types including saline. Due to such favorable climatic conditions, it becomes easier for supplier to get Sesbania seed out of which powder is produced. With the awareness about the use of sesbania gum powder, the farmers started growing its plant as a major crop to yield better incomes. The farmers are skillful and adapt new technologies in farming to increase the production. The farmers have adopted Precision Farming which is based on Information Technology. It reduces the some of the risk. Thus, it is environmentally sound and it can help to sustain natural resources. GPS (Global Positioning System) and Geographical Information System (GIS) are the technologies used in Precision Farming. 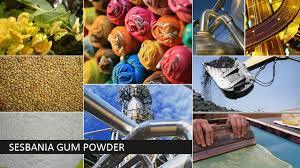 It becomes easy for an exporterto exportsesbania gum powder due to its constant availability. Indian Government has furnished farmers with a great infrastructure that has motivated the growth of Sesbania plants. Input based infrastructure: The farmers are facilitated with Quality Seeds, Fertilizers, Pesticides, Farm equipments and machineries etc. to cultivate good quality yield. Resource based infrastructure:They are provided Water/irrigation, Farm power/energy, etc to support the cultivation process. Physical infrastructure: The excellent infrastructure of Transportation, Storage, Processing, Preservation, etc helps farm suppliers to supply the high grade goods in market. Institutional infrastructure: The farmers are helped with Agricultural research, Education of technology, Information & Communication services, Financial or Banking services, Marketing, Export Opportunities, etc. to make their work hassle-free. The Government encourages exporters to export the products by providing relief and promoting the goods. Often it is said that, competition increases the ideas and innovation as well as enhances the quality of the work. Adopting new farming techniques has resulted into high and quality productivity per unit of land. Gettingthe high quality of Sesbania Gum powder is necessity to fulfill the industrial requirements. The buyers across the globe purchases Sesbania Gum powder of good quality at reasonable rates from India due to competition. The company manufacturing this powder must maintain the consistent standard of goods and incomparable services to sustain in competition. The farmers cope up with the demand of Sesbania Gum powder by the sweat of their brow. The usage of Sesbania Gum powder is increasing and so as the demand. The demand is more often from Oil drilling industry where it is used as floatation agent, in Food as additive,in Textile as sizing agent, etc. Sesbania Gum Powder is emerging as India’s largest item of farm exports since 2012. The total value of exports for the sesbania gum powder is approximately 4 million US dollars annually with a total quantity of export reaching over 2.8 million kilograms annually. Altrafine Gums came into existence in 1982. They are delivering quality goods and outstanding services since past 36 years. They have a wide network with Sesbania growers who provide quality raw materials. They have excellent infrastructure and proficient R&D department which helps them to manufacture superior quality of Sesbania Gum powder. Besides this, the company supplies products such as Guar Gum Powder, psyllium husk powder, Cassia Tora Powder, Locust Bean Gum Powder, Indian Spices & Seeds, Animal Feeds Products, etc to various industries such as Food, Textile, Tobacco, etc successfully. There was always a huger of success which propelled them to explore and adapt new technologies in the company.The company received the reward for its hard work when it was awarded as the first winner of Biggest Exporters, Gujarat. There has been a lot of interest in the plant gums in the recent years due to their diverse pharmaceutical applications in various industries. Some of these applications include usage as protective colloids in suspensions, gelling agents and diluents, and even as bases in suppository. Research has shown that the sesbania gum yields a very high percentage of mucilage going up to approximately 33 % of the total content. It contains high molecular weight polysaccharides made up of galactan and mannan units that are combined through the glycosidicbonds, thus making it very similar in structure to other well known hydrocolloids. The gum is extracted from sesbania seeds, and occurs as a white loose milky powder which is soluble in water and insoluble in organic solvents. In cold water it disperses to form the viscous solution that is much higher than that of other natural hydrocolloids. The main contents contributing to industrial usage are the viscosity. When this is determined using the “brooke field viscometer, at temperature of 25 degrees centigrade, it give a range of 2500 cps minimum to 5000 cps maximum. This level is high and can be utilized for various industrial applications. The powder has a PH range of 5.5 to 7.0 and has been seen to have very low heavy metal content. The sesbania gum is used in the manufacturing of dye thickeners and as a sizing agent in the textile and other industries. Flocculation process; the powder is heavily used as a flocculant in the waste water treatment. It has also been used up in the mining industry as an important floatation agent, used in the separation of minerals from the waste particles. In the petroleum industry, the sesbania gum powder is used as a blockingagent, water resistance – reduction agent and tackifier used in the preparation of fluid cracking for enhancement of oil production rate. It has emerged that the sesbania seed can be used in the manufacturing of feed for animals such as bird feed mixtures as well as a cover crop for birds. Research has shown that under certain temperature regimes the sesbania gum will behave like certain gums like the carob gum while at much higher concentration it exhibits properties of the guar gum. This discovery has important implications in industry as it has shown that the product can be used to replace the much more expensive hydrocolloids in the market. Other important characteristics that are unique to the sesbania gum powder include its good release profile, physical stability and good spreadibility which are important to many manufacturing processes. Research has shown that the sesbania plant can grow on alkaline soils as well as water logged soils. This is a special property that has not being exhibited by many other plants. This creates a competitive advantage for the sesbania production which can make it more easily available and affordable to sesbania gum manufacturers. The sesbania plant is native plant in the Indian continent where it has grown freely as a weed. With advancements in research, it has been seen to have numerous chemical compounds that can be utilized in various industries. The sesbania belongs to the family of leguminosae and it contains a high number of sterols, saponins and tannins in its chemical structure. These are responsible for the various chemical properties of the sesbania gum powder. The plant is a small erect and quick growing, soft wood and short lived tree that grow 5 to 12 meters in height. Over the recent years the plant gums have evoked a lot of interest in the various industries due to their potential and diverse applications. This is because they can act as diluents, binders, disintergrants in and thickeners in various liquids, protective colloids in suspensions, as gelling agents and as bases in industrial chemical formulations. They have also been recognized because of their biocompatibility, availability and great substitutes for the other more expensive formulations. The sesbania seed gum has still not been fully explored in the various industries despite having all the required chemical properties. It contains the requisite high molecular weight hydrocolloid polysaccharides responsible for the chemical properties of similar gum powders and can therefore serve as a good substitute for the other more costly gum powders. In addition to the polysaccharides that make up the chemical structure of the gum, the sesbania plants also contains the chemical leucocyanidin and cyaniding present in the seeds, oleanolic acid and its methyl ester as well as keemferol compounds also present in the other parts of the plant. Further analysis shows that the bark of the plant contains tannins and gum while saponins and sesbanimide can be isolated from the endosperm of seeds for other industrial uses. The mucilage from the endosperm of the Sesbania Grandiflora seeds is extracted in laboratory trials through multiple maceration technique with water as a solvent. It has proven that the seed endosperm yields a high proportion of up to 33% mucilage. When this mucilage is mixed with water easily forms gels which can be used in various industrial processes. Continued research has showed that this gel has good release profile as well as good physical stability and spreadibility in addition to having a PH of 5 – 7. The sesbania gum powder has also been used as a flocculant in waste water treatment to assist in the flocculation process of particulate matter suspended in the water. 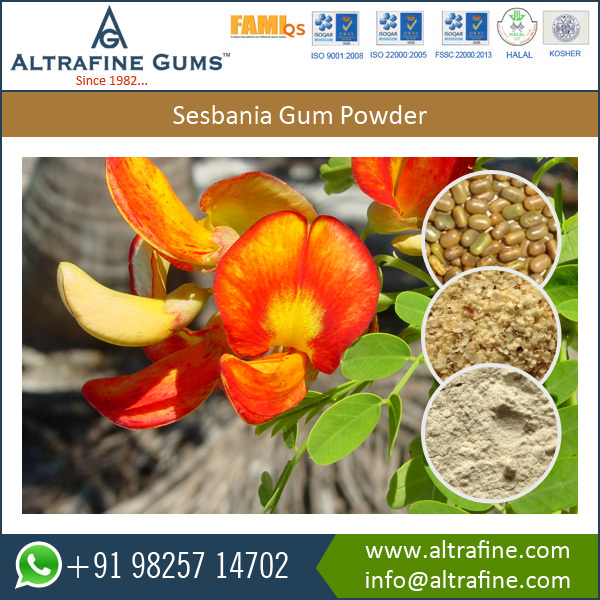 The sesbania gum powder is extracted from the seed and originated from India. It is white in color loose milky powder that easily dissolves in water to form a sticky solution. The sesbania has been found to have stickiness that is up to ten times more than other gums of plant origin. 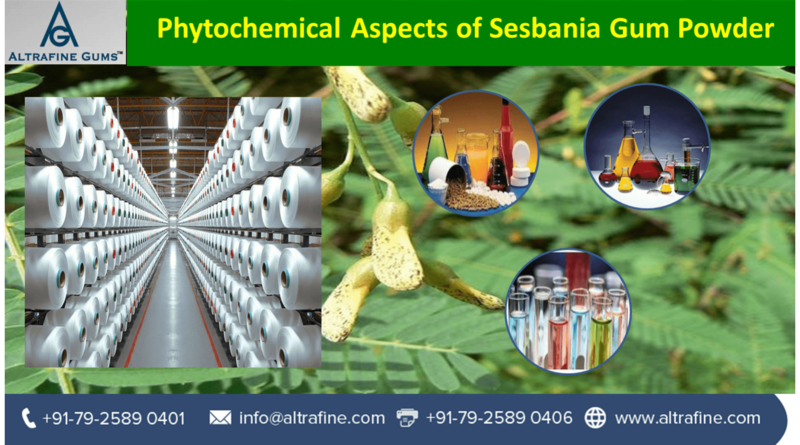 Recently the sesbania has generated much interest due to their extensive applications in industry. The gum is relatively cheap, biocompatible and also readily available from agricultural production. There has been less research on this crop due to its close similarity in structure to the guar gum. There has also been increasing modifications in the structure of the sesbania gum to enhance its effectiveness and functional properties in an aim to increase its usage in industry. In the mining industry, there is also need for more research into usage in more functions to enhance its market. Currently, it is used as an important floatation agent. This is a process involves separating minerals from the waste particles, and therefore it helps in the waste separation process. Under different temperature regimes, the gum may behave like carob gum, and at concentrations higher than 1%, it displays properties of commercial guar gum. With this in mind it has greater advantages than the other gums in the same category. Modified forms of the sesbania such as the hydroxyl-alkylated Sesbania gum have greater applications in industry. Sesbania Splits; Apart from industrial applications, the sesbania can also be marketed as a good green manure for crop production. In these areas of south and south East Asia, it has been marketed effectively as a soil restorative, to increase the productivity of the crop. Sesbania Seed; this seed has also been seen as a good source of animal nutrients, and can be grown for production of bird feed mixtures. The plant makes a good cover for ducks and game birds as well as quail foods. There has been increasing unattractiveness in the usage of the other forms of gums such as the guar gum due to high prices as well as times of product scarcity. Companies in the United States and the world have discovered the sesbania to be an economically viable alternative to the guar gum. Other research has shown sesbania gum powder to be superior in some qualities than the guar and other gums. The sesbania plant can grow on highly alkaline soils and can do well in water-logged soils where other crops cannot be readily cultivated. The plant never requires crop displacement for production and will add more nutrients to the soil. Low production costs of the sesbania gum translate to cheaper market prices and greater returns for the users. Greater research is needed on the uses of the sesbania gums to develop its demand. Increasing prices and declining production of guar gum may eventually enhance the demand for the sesbania gum powder. The gum extracted from the sesbania seeds contains natural polysaccharides and the chemical construction appears similar to that of guar gum. However, gum of sesbania is insoluble in organic solvents but soluble in water. The polymer of this gum has been tested in various means to completely know its properties and it was proved to show improved performance in terms of viscosity. 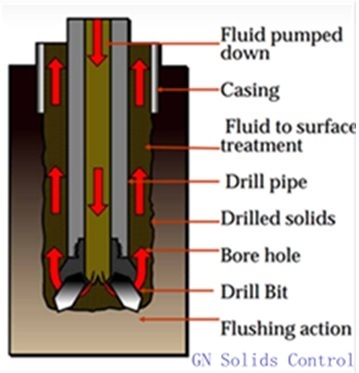 Drilling fluid is a combination of water, clay or mud and weighing element. The weighing materials are those that are balanced in drilling fluid to enhance the density or viscosity which in turn supports in heaving shales. The role of sesbania begins here as it is applied as one of the powerful components in the preparation of weighing material along with bentonite and water. In some cases drilling mud preparation require components with alkaline properties to make it more efficient for drilling in oil wells especially and here too sesbania works compatible when combined with alkaline. The liquid phase has to be more viscous so that it can be easily sent to the filter cake and this can be done only using high molecular weight polymers like sesbania gum. How Sesbania Gum Powder works for Oil Drill? This gum powder showed better results in terms of viscous property. Gel strength is comparatively lower than guar gum which appears to be the strongest factors that encourage research people to test this product as an important ingredient for making drilling fluid. It was also found through tests that this gum powder do not exhibit degradation even at 85 degree C. This property helps for in depth drilling requirements and subsequent application as drilling mud worldwide. Oil well sector has a good demand for drilling ingredients and Altrafine supports industrial requirements in terms of supplying bulk quantity of industrial grade seed gum extract of sesbania. Our main product is processing and supplying guar gum and different types of extracted materials from different plant seeds. We have a big team of research professionals who perform the testing procedure with the help of our technically well equipped laboratory while processing with seed extracts. In the present scenario of global market we are strong enough to produce higher quantity to support large scale production requirements. We supply our products to worldwide consumers which include U.S, Europe, etc. The chemical structure of sesbania gum powder makes it a compatible ingredient for oil field drilling. Its viscosity has been tested in comparison with guar gum and found to show better results when added as a drilling fluid ingredient.